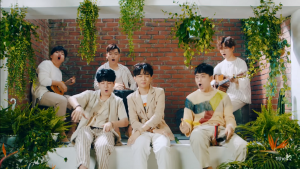 The East Light Shows Burgeoning Talent In "Love Flutters"
Pop-rock group The East Light has returned with their second album release, Love Flutters. The band’s second effort continues their trajectory into tween-rock but takes some interesting risks with production and experiments with electronic influences. The album includes some familiar sounds, namely two songs from their January single release, “Perfect Man” and “Don’t Stop”. The other six tracks are brand new and show the group fearlessly exploring different styles of music. The group’s members are some of the youngest in K-pop and their exuberant performance style draws from their energy in a great way. The production is not as slick as it could be; however, the winsome quality of the melodies is usually good enough to distract from any gaps. The short run time of the album also disguises some of the weaker elements as you barely notice them before they’re gone. The songs aren’t arranged according to a narrative concept, and there seems to be a looser approach to album creation than usual. The collection of songs don’t crack a ten-track listing, and stay under the 30-minute mark on run-time. The shorter length means the album is over in a moment and the buoyant pace doesn’t flag. 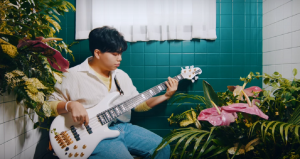 While the songs don’t seem connected in concept or theme, they all have a brightness in their tone and delivery that feels characteristic of The East Light. The members’ vocal performance floats with the lightness of prepubescence belying the conceptual thrust of most of the songs. It will be interesting to hear how the sound of the group will adapt once the members’ voices break. The airier delivery doesn’t always land, particularly in songs that need to pack a punch like “Don’t Stop”. Generally, the singers are able to cope with the material and when they’re not, it’s over very quickly, so it hardly matters. The group sounds most comfortable in the sunnier, more laid-back arrangements of songs like “Valentine’s Day” and “Love Flutters”. “Valentine’s Day” has an easy, sing-along vibe that suits the members’ vocal styles, and it has one of the most harmonious instrumental arrangements of the album. It sounds like a style the members are at ease in and they excel at it. “Love Flutters”, conversely, uses experimental instrumentation to create a shimmery, warm slice of island pop. The muted strumming of an acoustic guitar provides a rhythmic backbone and familiarity to the tune while bright steel drums and effects keep things interesting. It’s an excellent choice for the title track of the album and one of the more successful attempts at a style outside of straight pop-rock. The production experiments don’t always pan out well. Moments in “Never Thought (I’d Fall In Love)” and “Never Let Go” incorporate EDM influences to limited success. The automated drums and synth-heavy composition in “Never Let Go” are less compelling than the blend of live instruments and effects in some of the other tracks. “Never Thought (I’d Fall In Love)” has a similar problem with artificial rhythmic effects that sound more suited to a game than a pop song. The song’s electronic sounds are uncomfortably married to a country style, reminiscent of the 1995 Eurodance affront to the senses, “Cotton-Eyed Joe”. For the most part, the forays into electronic and dance territory are listenable. “Let Me Stay With You” has a mostly electronic score, using familiar tropical house elements, but its melody is compelling enough to bear repeating. The experimentation is interesting but the group really shines collectively when they’re allowed to play in the realm of pop-rock. Their previous release, “Real Man” is one of the highlights of the album, due, in most part, to how tight they sound over the groovy bass line and live drums. Overall, the album has notable flashes of potential where The East Light shows their talent. A more coherent sound or concept would benefit the group, but their current progress has been considerable even with a looser approach. While any deficiencies in performance or production are diminished by the speed at which the songs progress, however, it would be nice to hear them play for a little bit longer. More time may mean more space to make mistakes, but it also means more opportunities to create a tween classic.